"Oh the depth of the riches both of the wisdom and knowledge of God! For who has known the mind of the LORD, or who became His counselor? Or who has first given to Him that it might be paid back to Him again? To Him be the glory forever. Amen." Sometimes it's easy to sing praise to God. Then there are the "But God" moments. Those moments when we question and doubt that what's going on in our life could even remotely be from God, who is good and kind, gracious, and merciful. "But God, why? But God, how? But God, who? But God, where? But God, what? But God, when? But God, how long?" The good and the bad comes so that we might know Him more intimately. When we bow the knee and acknowledge that both come from the hand of our merciful, all-wise God, we can trust His unfathomable ways. We can trust He will be with us through the valleys and on the mountaintops. We can obediently give praise to God with the broken hallelujahs of our life. May you know the depth of the riches He has for you. May you plumb the depths of His wisdom and bow your knee to the unfathomable ways you don't understand. May you seek God and His will for you and accept the good and the bad. May you see all you have comes from His hand, for it is from Him and through Him and to Him that everything came into being and is. May you be able to say with praise, even if through tears, "to Him be the glory forever. Amen." This weekend I'm linking up with Barbie's Weekend Brew and also Charlotte's Spiritual Sundays, and Scripture and a Snapshot. Hey weary soul, are you feeling invisible today? Not feeling His presence? The truth is we're human, and we can't trust our feelings. They're as fleeting as leaves on a tree, here for a season, then gone. Not "feeling" His presence has its purposes. Sometimes He needs to bring us to a place of repentance of sin or a place of despair so we will seek Him. Other times He may be teaching us to cling to what we know about Him. His presence is not based upon our feelings; it's based upon what we know to be true about God. And what we know is this: His promises in Scripture assure us of His abiding presence (Hebrews 13:5). He wants us to know His REAL presence, not only His FELT presence. Do you have a seemingly insurmountable task ahead of you? He goes before you; He is with you. Don't be afraid of the unknown ahead. Today may you be confident of His presence; certain of His promises, and assured of His love. Distressed? Depressed? Be at Rest. don't let the current events of this world bring you distress. He left The Comforter with us to set our hearts at peace. not as the world gives, do I give to you. He is our fortress in the storms of life, our rock, our salvation. “My soul finds rest in God alone; my salvation comes from him. May you go forth today being reminded of His promises to you. Rest in Him and His promises. This weekend I'm linking up with my friend, Barbie over at My Freshly Brewed Life for her Weekend Brew. Feel free to join us. Share a post, photo scripture - anything that breathes life and encourages. 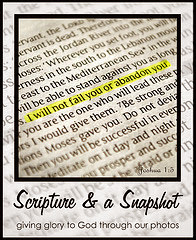 I'm also linking up with Scripture and Snapshot today. Trending Now! Oops...You Missed It! Emails clutter our mailboxes, Newsfeed and Twitter feed change at break neck speed with what's trending now... RIGHT NOW.... oops! You blinked, you missed it! On to the next Breaking News story. Our hearts race, we fret, life is dog-earred and breeding with discontent. We go for a run or a walk to burn off calories....Endorphins released to burn off the stress, heart rate up to burn off the calories...that's all good, but we're still caught up in the world's rhythm of rush. We fail to pause and see the tiny little blessings of living life at a slower pace. God created all things for us to enjoy and to point us to Him. He desires us to slow down enough to see and enjoy beauty of His handiwork. We see life through our own pair of eyes (that God gave us - have you thanked Him?). My eyes capture moments of beauty in nature. That's how He wired me...to stop, look, and listen for Him in the ordinary. The tiniest of flowers breaking through the debris covered ground often gets ignored and walked past... or walked on... by some with their eyes fixed on the next thing to do and place to be. For me, my gaze is most often downward - partly because I'm not real sure footed so I'm always watching where I walk. But it's in that eyes down position that I see the tiniest of flowers amidst the debris and I marvel at how something so small could push through all the dirt and debris, only to look up in praise to God for a brief season and then vanish away. It's that moment that whispers to my heart with a holy hush. "Don't get caught up in this world. Learn to live in the glory of the ordinary. anchor life to the eternal." It's all about Him...every second of every day. You can anchor your life to that eternal truth and it will hold you to the Hope that the best is yet to come. Like Charlie said, don't get so caught up in this world that you fail to live in the glory of the ordinary. Look to see Him in the moments of life. "In everything give thanks, for this is the will of God in Christ Jesus concerning you."